Scoring a 90 for any product is hard to do on this website. Having three out of four previous reviews rate above 90 is enough to make a lasting impression. All that out of the way, let’s get on with the review. The Moore & Bode Tambaku comes wrapped in a cedar brown Colorado wrapper. The wrapper is a bit splotchy, and there are a couple of significant veins. 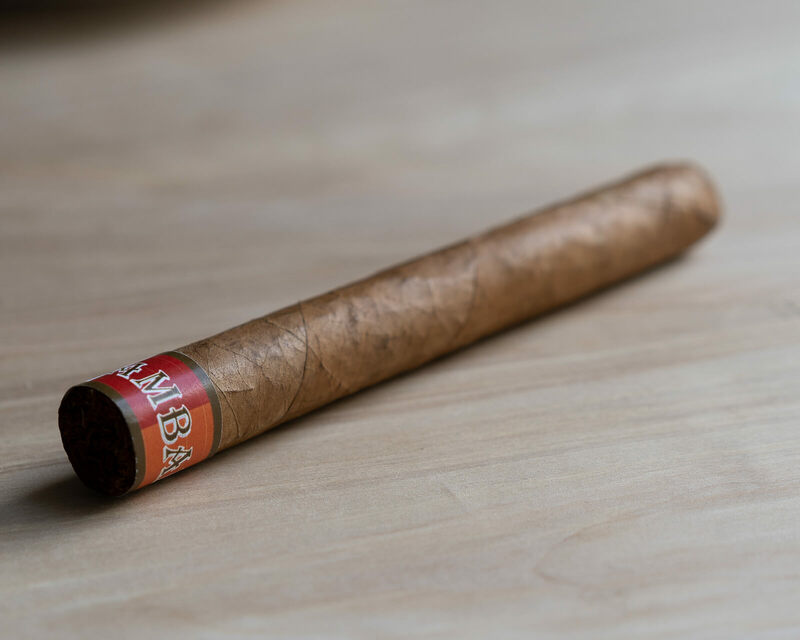 When squeezed, the cigar has a light springiness but its otherwise clear that the cigar is packed solidly and consistently the length of the cigar. After using a straight cut, I test the draw and, like every Moore & Bode cigar I’ve had up to this point, the draw is pretty much perfect, with a restrictiveness level of 7/10. There isn’t much on the cold draw other than some cereal, a bit of fruit, and some wood. Off of the foot of the cigar it’s a similar profile, just a bit brighter and with some added spiciness. The Moore & Bode Tambaku lights easily and produces ample smoke. The flavor profile is interesting and a bit hard to pin down exactly. Broadly speaking, it tilts toward the tangy/bitter end of the spectrum, with notes of cedar, vegetal, fermented orange juice, and something akin to paper. I wouldn’t call the texture creamy, but it is extremely smooth. Strength and body both clock in at a notch or two above mild. An interesting start to this cigar. The ash holds for a impressive inch and a half while also keeping a straight burn. By this point, the smoke has become a bit more full bodied, now sitting just below medium. It has also developed a nice creamy texture which plays nicely with the tangy notes. The flavors on the palate have shifted as well. The bitterness from the beginning of the smoke is gone, replaced by a profile nicely balanced between sweetness, tanginess, and spice on the tongue. The tanginess is characterized by vegetal notes akin to what I’ve experienced in some of Arturo Fuentes classic blends (Xtra Viejo comes to mind), while the sweetness comes in the form of something like cereal or maybe graham crackers. The retrohale has also developed nicely, showcasing some light black pepper, wood, and cereal flavors. Very, very good. The experience remains mostly the same until the halfway mark, where the tanginess, sweetness, and cream subside, while the wood takes center stage alongside spiciness as a supporting character. I’m not totally enthused by this change of pace only because the complexity of the cigar seems reduced and the creamy tones rounded out the whole experience well. Construction reminds consistently good, with a straight burn and the ash falling in increments of an inch or more. The final third ramps up past medium in both body and strength, with toasty bread, graham cracker, wood, and a long, lingering spice on the tongue. It isn’t so different flavor wise than the earlier parts of the cigar, but the flavor profile is right at home with this level of strength. It remains this way until last last inch and a half when the smoke heats up a bit too much, providing a good moment to set the cigar down. The Tambaku definitely is a step up in terms of strength from the other Moore & Bode cigars that I’ve smoked. 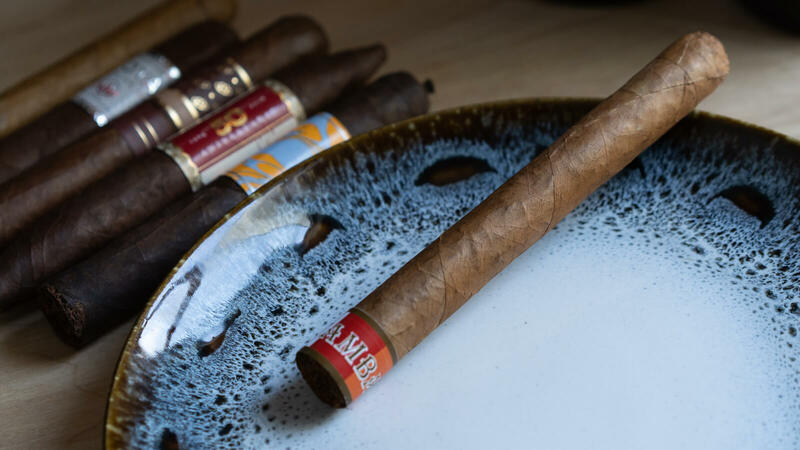 Though I prefer other blends like the Candela, American Fire, and Adelante, the Tambaku still creates a flavorful and complex experience that is commendable. My only complaint about my experience smoking Tambaku is that the increased strength throws of the balance at times. If I had to pair this cigar with anything, it would have to be an espresso with cream. It would round out the more wood/vegetal forward sections nicely.